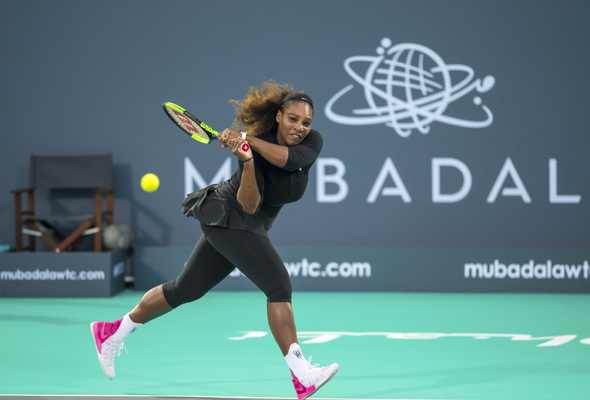 23-time Grand Slam champion Serena Williams has just been added to the impressive line-up of stars competing at the 2018 Mubadala World Tennis Championship (MWTC) in Abu Dhabi. The tennis superstar will be joining her sister, Venus Williams, in the women’s side of the Championship – with lucky fans having the chance to see the siblings battle it out in the UAE capital on the first day of the three-day tournament. “I loved playing in Abu Dhabi last year,” said Williams ahead of the tournament. “I am excited to return to such a beautiful city and to see my fans. This time, I’ll be playing against my sister, so the match will be even more special,” she added. Widely regarded as one of the greatest tennis players of all time, Williams has been an inspiration to many both on and off the court through her impressive 20-year career as an athlete. Serena made her return to competitive tennis at MWTC last year, after nearly a year away from the game following the birth of her daughter. As well as the Williams’ sisters, the 2018 MWTC will see six male tennis stars battle it out, including 14-time Grand Slam Champion Novak Djokovic, world number two and 17-time Grand Slam champion Rafael Nadal, and last year’s defending MWTC champion, Kevin Anderson. French Open finalist, Dominic Thiem, Australian Open semi-finalist Hyeon Chung and recent Paris Masters Champion, Karen Khachanov complete the line-up. Now in its 11th year, the MWTC offers spectators the equivalent of a Grand Slam quarter-final, and is seen by many as the first tournament leading into the Australian Open. There’s plenty of action off the courts, as well. A dedicated Tennis Village will offer a packed schedule of activities across all three days of the tournament, with themed experiences including a kids’ day, foodies’ day, and ladies’ day.